In 1940’s Ukraine Anton Schostak lives a simple life of a peasant farmer. But to the east the Nazi war machine is headed toward Anton’s peaceful existence. He is Jewish and the Nazi’s comb the countryside looking for Jews to make Ukraine Judenfrei—free of Jews. 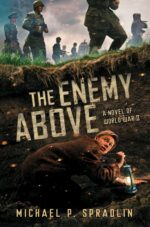 With his father off fighting with the Polish cavalry, Anton must escape with his grandmother, Bubbe. As the Nazi’s draw closer and closer, freedom becomes a dangerous game. 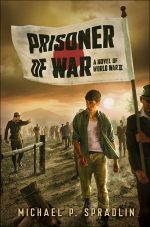 Major Karl Von Dueson of the Gestapo, the Nazi secret police, is convinced that he can advance his career by capturing as many Jews as possible. But Anton and his Grandmother continue to elude him. When they take refuge in a nearby cave the Major discovers them and Bubbe is captured. Now Anton must leave the safety of the cave and find his grandmother. When he manages to free her, Von Duesen, now nearly unhinged, will stop at nothing to find them. Anton must use every bit of energy and skill to stay one step ahead of a madman. 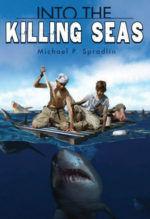 More accessible to a younger audience than most historical novels on similar topics, this chapter book features a determined protagonist who does what he can to help his family survive. The stakes are high and so is the tension as the action scenes play out. Set in an interesting locale, this will satisfy historical fiction fans who want page-turning action. At first, Anton thought the rumble was a summer storm. They often blew in from the west this time of year. The rain would sweep across the wheat fields, the far-off thunder sounding like an apple rolling across the wooden floor of his family’s small farmhouse. Yet when he looked up from the book he was reading and glanced through the window at the sky, no looming storm clouds marred the pink haze of twilight. The rumble was something else. In the distance, he saw flashes of light on the horizon. It wasn’t lightning, nor fire. It was an explosion of artillery. He stood and padded to the bedroom window as the noise grew louder. Shell after shell detonated and the night sky became a solid bank of light. Something truly horrible must be happening. Anton watched the blasts for a moment longer. Battles always made him think of his father. Was he even still alive? It was 1942, and Papa had left their village in Ukraine to join the Polish army three years earlier, right before Hitler had begun his blitzkrieg across Eastern Europe. Poland, with its cavalry still riding horses, was little match for tanks and cannons. But Anton’s father had joined the fight anyway. He’d said fighting Hitler was the only way to stop the madman. “Are you out there, Papa?” Anton whispered. Then he prayed, asking God to please send his father home. And Uncle Pavel as well. Pavel was nineteen years old. He was more a brother to Anton than to Papa. Every night at dinner, he’d talked of leaving the farm to join up with one of the partisan militias who were fighting the Nazis. But Anton’s grandmother had always forbidden it. “You will not go!” Bubbe would say. Bubbe was the Yiddish word for “grandmother.” She was old and her back was bent from years of hard work. Bubbe used a polished wooden walking stick, and when she spoke she would grab it from where it leaned against their dinner table and rap it firmly on the floor two times to emphasize a point. Thump. Thump. Everyone who knew Bubbe knew that when she thumped the walking stick, she was serious. It meant “pay attention.” You were about to get a lecture. Pavel would keep his head down, shoveling potatoes and bread into his mouth. That was all they had to eat anymore. Oftentimes there wasn’t even any bread. Usually Pavel would get up and storm off to the barn or go to the village square to listen to the gossip. Sometimes he’d get his hands on a newspaper that was passed from household to household and scoured for information about the war. No one knew what to believe. The Germans were winning. The Russians were pushing them back. The English and Americans had landed in France, but the Germans pushed them back into the sea. No, the English and Americans had gained a foothold and were driving the Germans back. Hitler was fighting a war on two fronts and losing both. Still others said the English and Americans had not even landed in Europe, and they were concentrating on fighting in the South Pacific. No one knew the truth or what to believe. “Bah,” Bubbe would say and throw up her gnarled hands. That signaled the end of any discussion. Another of Anton’s uncles, Dmitri, remained quiet whenever Pavel and Bubbe argued. He was the middle son. Anton sometimes thought things were hardest on Dmitri, caught in between his mother and younger brother. He’d worked harder to keep the family fed and clothed since Anton’s father had left. And Anton knew Dmitri worried all the time. That Pavel would leave. That there wouldn’t be enough food. That some night the door would be kicked in and their small house invaded by the gestapo. Anton’s bubbe and his uncles had tried to keep the stories from him, but he had heard them nonetheless. The Nazis and their leader, Adolf Hitler, hated Jews. At first, no one had believed the Nazis would be bold enough to do anything about it. But now they’d all heard too many tales of entire Jewish neighborhoods in cities to the west being rounded up and sent away. All over Europe, Jews fled their homes. But many waited, refusing to believe it could happen to them. Then the Nazis arrived. They blasted their way across the continent to prove the dominance of the Third Reich. And everywhere they went, Jews were rounded up, put on trains, and never seen again. Now it seemed the fighting was upon them. The detonations grew louder. Flickering flames lit up the entire horizon. That could mean only one thing. The Nazis were now destroying villages and towns on their way through Ukraine. If the Jews fled before they arrived, the Nazis would burn everything, making sure there would be nothing left for them to return to. A loud explosion drew Anton’s attention. It came from the northwest, toward the village. The door to his room burst open. His grandmother stood in the doorway holding an oil lamp. The wick was turned down very low, giving off only the barest amount of light. Judenfrei was the German word meaning “free of Jews.” Anton had heard the village elders talk of the German army. They swept into towns and villages and either killed all the Jews immediately, or sent them off to the camps. Where once hundreds if not thousands of Jews might have lived, the gestapo made sure none remained. The gestapo was the Nazi secret police and they were tasked with finding and eliminating the Jews wherever they went. Anton could not imagine it. “But, Bubbe . . .” Anton said, before his words trailed off. “What is it, my kinder?” No matter how big he got, Anton would always be a child to Bubbe. “Nothing,” Anton said. He hurried about his small room gathering up his meager belongings. He had been about to ask about his father. What if Papa came home and found them gone? How would he know where to find them? But Anton had noticed lately that whenever the subject of his father came up, Bubbe’s eyes would water and her voice became a whisper. So he kept his questions to himself. Someday, when the war was over, his father would come back. Or Anton would go find him. Oh, Papa, he thought. How I miss you every day! Anton remembered how much his papa had loved to play pranks on his younger brothers. When they were working in the fields, Papa would stuff dirt down Pavel’s pants and laugh as his hot-tempered little brother chased after him. When they still had horses, Papa would fiddle with the harnesses when Dmitri was plowing the fields. After a few rows the harness would become hopelessly tangled. Uncle Dmitri would curse and Papa’s booming laugh could be heard all across the farm. It seemed so long ago. Anton picked up the small photo of his father he kept on the table by his bedside. His mother had died of a fever when he was a baby. All he could remember of his childhood was his father and their life on the farm. Lately, when he was working in the fields or doing chores, he thought of his father. Of his rough hands. His deep laugh. His warm smile. But with every passing year, it was becoming more difficult to remember Papa’s face. At night he would stare at the photo, determined to memorize each feature, from his father’s rich black hair, to the dancing merriment in his eyes. But it seldom worked. Each day he felt Papa slipping further and further away. The flickering light of the artillery lit up Anton’s room as he gathered up his few possessions. Bubbe had prepared the family for the day the Nazis might come. He spread his warm woolen blanket out on the floor. On it he placed a pocketknife, a small hatchet, a tin cup, two changes of clothes, a few candles, and some matches. He rolled the blanket lengthwise until it formed a tube with his supplies in the middle. Then he folded it in half and tied the ends with cord. Now he could easily carry everything over his shoulder. Anton left his small room off the kitchen and joined his waiting grandmother. She stood by the door in a dark dress with a cloth scarf over her head, holding a cloth bag in one hand and her cane in the other. As they left their small home, it did not occur to Anton that he might never see it again. He had heard the elders talk about Borshchiv’s history. It was surrounded by endless fields of wheat and potatoes and had been alternately claimed by Poland, Austria, and Russia in the last fifty years. And now the Germans were coming. They might be the worst of all. The noise from the artillery fire was growing louder. But the Russian army was far to the east. Who were the Nazis fighting? Perhaps members of the partisan militia or the Polish resistance? All the gossip said the Polish army had been crushed by the Germans’ first attacks, but perhaps some of the fighters had survived? It seemed unlikely. But if Papa was among them, Anton would try to hold out hope. They quickened their pace. Anton took the cloth bag Bubbe carried, so she could walk faster. He could not imagine being captured and sent to the camps. The degradation, the unsanitary conditions, the forced labor. Bubbe would never survive. They traversed the wheat and potato fields surrounding their farmhouse and after walking several hundred meters they reached the tree line. Anton felt better. The night was cloudy and moonless, but he had felt exposed crossing the field. The Germans would have many vehicles patrolling the countryside and the gestapo was famous for using dogs to track down their victims. Among the trees they would at least be harder to spot. About an hour later, they had almost reached the crossroads. Anton always thought it was funny to call the dirt paths that ran through their countryside roads. They hardly qualified. In the spring when the rains came, they turned into a muddy morass that oxcarts and livestock became hopelessly mired in. Yet they were the only way that the locals could travel or take their crops to market. Every farming family knew the countryside well. Perhaps that would keep them alive. But they would have to hurry into hiding. Bubbe wasn’t nimble enough to run for it if the Germans stumbled upon them. Anton was not sure how old she was. She never mentioned her age and had forbidden anyone from speaking of it. “I have been around a long time,” she would say, “but I am wiser and smarter than all of you.” His grandmother had worked hard all of her life. Now her body was bent and she moved slowly, partly because her bones ached and partly because of the darkness. They finally reached the crossing and found a shadowed spot to wait for Anton’s uncles. Anton helped Bubbe squat low in the wheat where they could be ready to hide should a German patrol pass by. Anton made no mention of the fact she called him by his name instead of “my kinder.” Usually, that meant she was feeling serious, or that he was in trouble for shirking his chores. But tonight he knew it was because danger was near. Anton looked to the west, where the sky still flashed with flickering light. Surely it was too bright to have come only from exploding artillery shells. The Germans must have lit fires to burn nearby villages and farms. And now the destruction was creeping ever closer. Anton pictured a tiger, stalking them through the fields and forest. He imagined it might pop out and devour them at any moment. Despite the chill of the night, he was sweating. They could do nothing but wait, and they did so in silence. According to Bubbe, Uncle Dmitri and Uncle Pavel would meet them here and lead them to a shelter they had found near the village of Verbata. Anton hoped they would arrive soon. Verbata was a friendly village, full of Jews and gentiles who knew each other well, and the thought of it made Anton feel safe. A flash of light to the west drew his eye. This one was close. Too close. And it was not accompanied by an explosive blast. Instead, an engine revved, cutting through the quiet night.